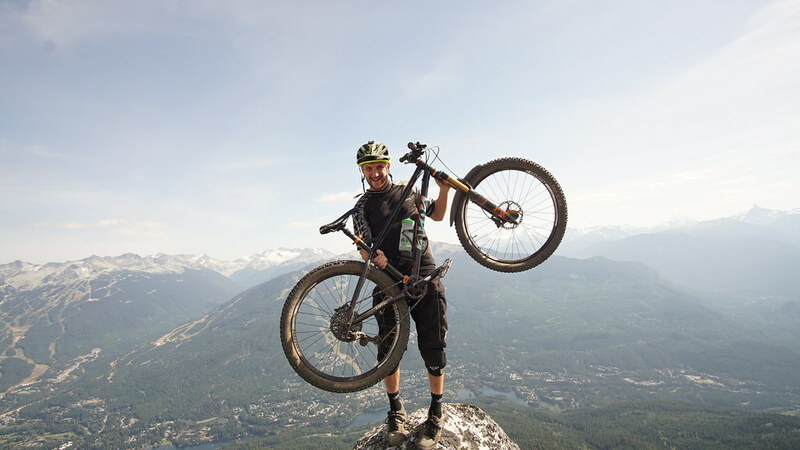 I think it’s every mountain biker’s dream to have the chance to go to Whistler and ride – ever since jumping sketchy jumps and drops in our local sand quarry as a teenager; we'd get back and watch Roam and Seasons Whistler segments over and over. Every year myself and a few friends head out on a summer downhill riding trip such as Morzine, Hafjell or Andorra. This year all the cards fell into place and the whole crew had the cash and the time to consider a 3 week trip over the pond to British Columbia, so we costed it up and booked our flights. None of the group, 9 of us, had ever been before so everything would be new and fresh to us all! The cost of taking two bikes on the plane wasn’t unreasonable, so I decided to take my Downhill bike for the bikepark, and pack my Cotic BFE to get some enduro laps. 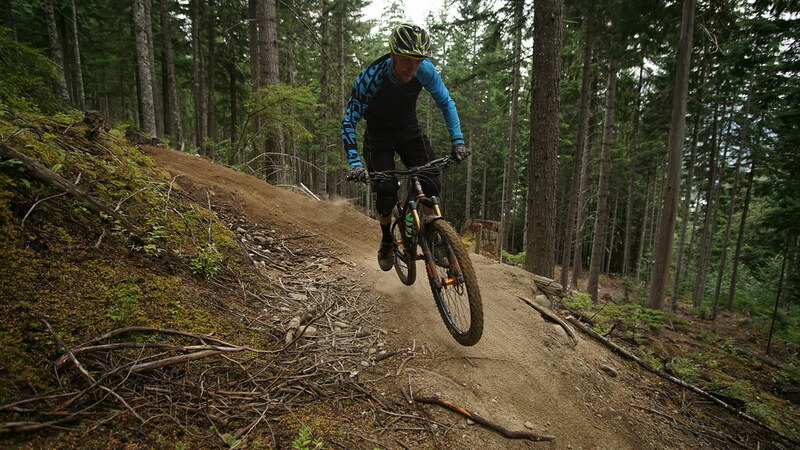 I’d scoured over trailforks for weeks before, and the list of trails inside and outside of the bikepark was endless. Like the Golfie on steroids! Sheffield being the close-knit scene it is, there were a fair few boys who have packed their bags for good and were living out there, so it wasn't long before some solid rides were planned to explore outside the bikepark. Billy’s Epic – A black trail unlike a lot I rode, super steep, amazing views, rocky and fast with a huge chute in the middle. We linked it into ‘The Rockwork Trilogy’ which had three trails of neat tech rockrolls. 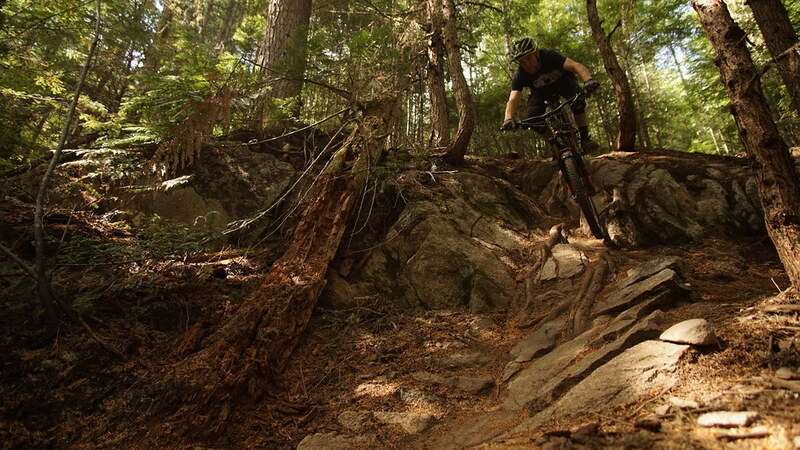 Green Monster - a short double black diamond trail outside of the bikepark with 3 huge rock rolls. The photo shows the first of the three – they only got bigger and more gnarly. Probably the scariest natural thing I rode. Rockrolls are just something we don’t get here in the UK – you must be super committed and stay off the brakes as much as possible. On the BFE the G outs at the bottom were something to contend with! D1 – a short pro line trail just at the bottom of the Garbanzo lift. Think 50-01 line but with more stepdowns and gap jumps! 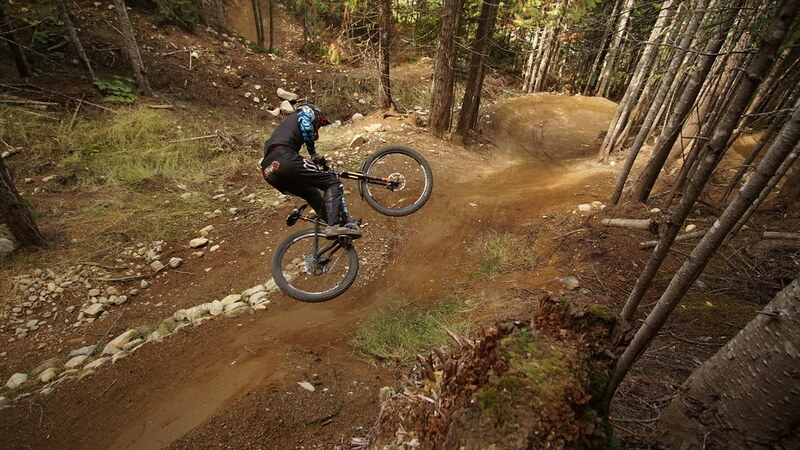 Perfect berms, high speed and massively committing. Once you knew where you were going it was a hoot. One of the harder jump trails to master. 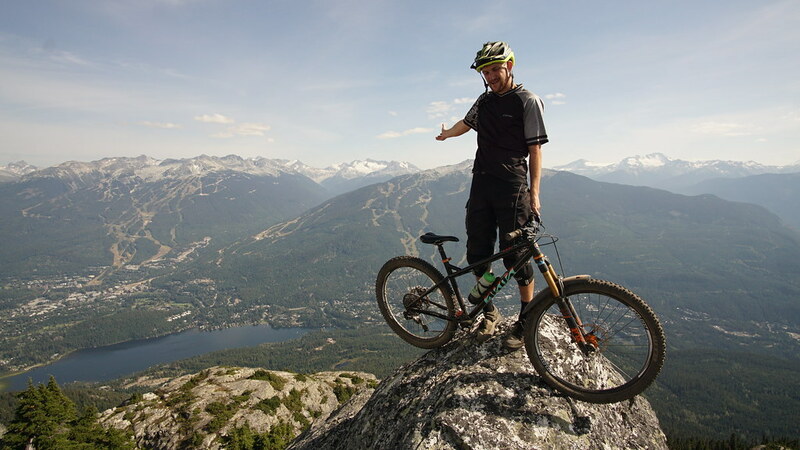 Lord of the Squirrels – a huge day out in the mountains on a sweet blue trail. 6600ft of climbing up to the top of Mt Sproatt. 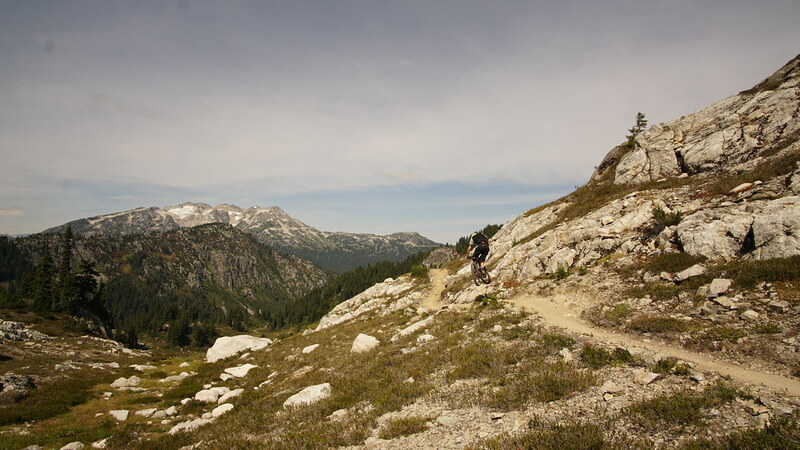 The climb up is purpose built and fairly steady, winding its way through the trees and then out to above the treeline with loads of sub alpine lakes and views. The climb itself felt like such an achievement to have completed, and we couldn’t have picked a better day for it. The trail down was just as rewarding. Super rough because of all the traffic the trail gets but loamy and the FLOW! Crabapple Hits – The biggest jumps in the bikepark, topping out at about 55ft long, but with a monstrous lip. I’d hit these on the downhill bike on the first day, but massively underestimated the speed for the biggest and 50/50 cased it. I’d worked out the speed after than before going for it on the hardtail, but I knew on the BFE casing like that wasn’t an option. After a few deep breaths I dropped in and sailed through the whole set perfect first time. The amount of airtime is insane!